A report from the Manchester Evening News on the 9th October 1990 on the upcoming demolition and the plans for the estate. The Manchester Evening News reports on the demolition on the 15th October 1990. 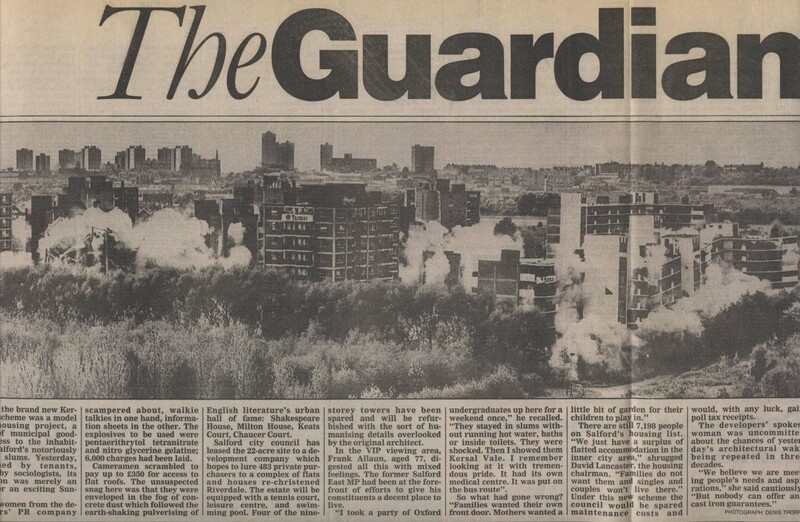 The Daily Telegraph reports on the demoltion on the 15th October 1990. The Daily Star on the 15th October 1990. The Guardian on the 15th October 1990. And the Salford Journal reports on the 18th October 1990. Some newspaper reports from the period just after the demolition. 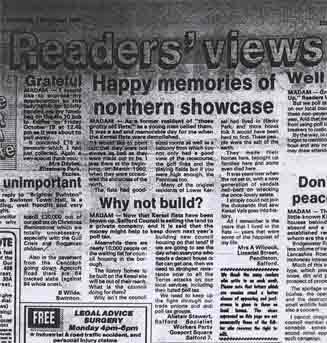 Some newspaper reports about the new property development on the site of Kersal Flats. The plan was to knock down all the flats except Shelley, Spencer, Blake and Cowper. To renovate those flats and to build houses on the rest of the site. This plan proved to be an absolute disaster and the plan quickly ran into trouble. Indeed anyone and everyone could have predicted this. Towards the late 1980s the council could not give a flat on Kersal Flats to anyone. It was clear that no-one was going to pay to live in one of the least desirable addresses in Europe. 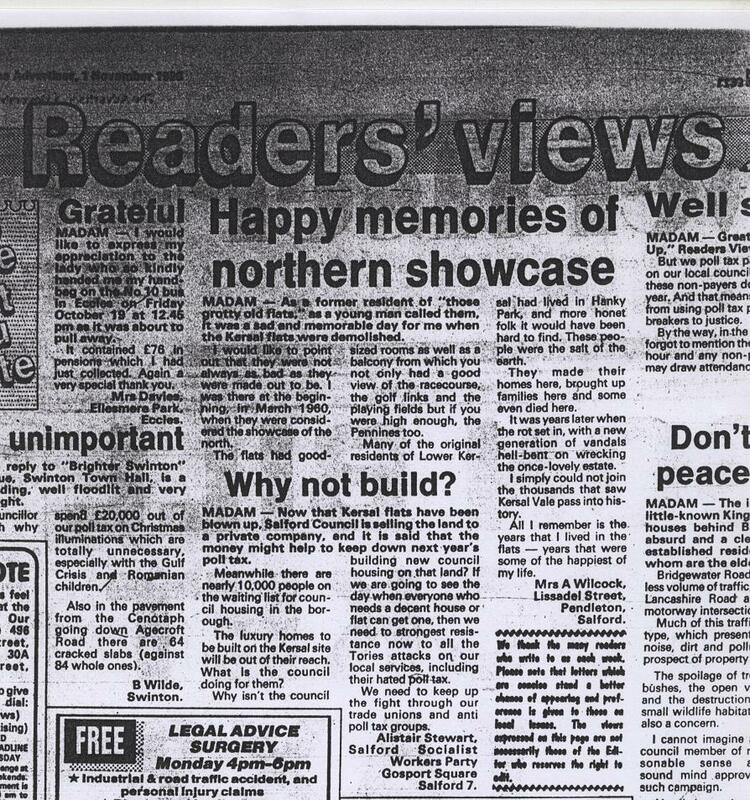 And the hard sell begins as Regalian Properties try to pitch Kersal Flats as luxury living in the Manchester Evening News on the 19th August 1991. And the hard sell continues with an advert on the 28th August 1991 in the Manchester Evening News. 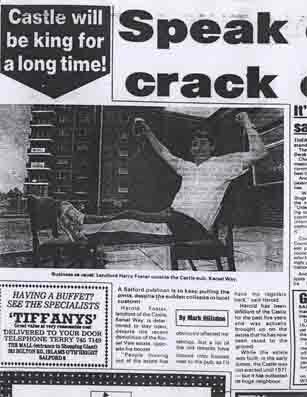 And more good news stories this time in the Advertiser on the 5th September 1991. Yet more good news stories highlighting the success of the project. But it all goes horribly wrong very, very quickly.